Sour karee is a thorny plant from Southern Afica bearing edible fruits. The fruits are not very tasty but still eaten by local people, especially in Lesotho. It grows in South Africa, Namibia, Lesotho and Botswana. 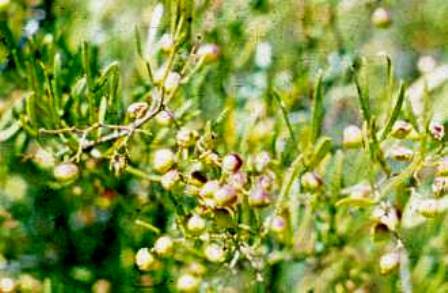 Sour karee is an evergreen, thorny, thin and crooked-stemmed shrub from 2 to 4 m high. The bark is grey, smooth and the branches are spreading white somewhat striate (marked with fine lines, ridges or furrows), often ending in spines. 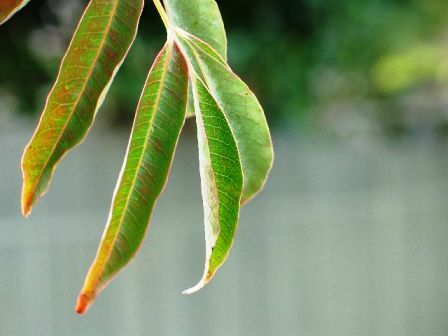 The leaves are trifoliate (has three leaflets) which is characteristic of the Rhus species. The flowers are minute, yellow-green in colour and insignificant. The fruits are drupes; shiny, light to dark brown in colour. The shape of the fruits is the main distinguishing character between this species from others. The fruits are edible but not tasty and are eaten by the Sotho people. 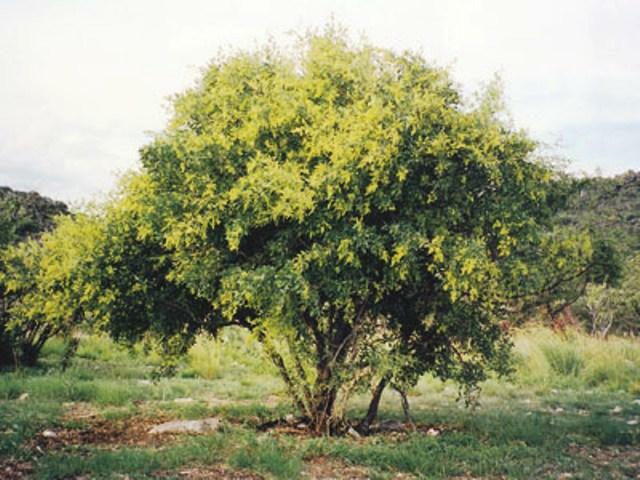 It is known as firebush in Namibia where it is used to extinguish fires. These shrubs are best grown from seed. The seeds usually have a shiny brown colouring when ripe. As soon as the seeds are dry they can be collected. The seeds are cleaned by rubbing off the outer parts, then dried in the sun, dusted in Bexadust and stored till sowing. The seeds can be sown immediately they are sun dried or stored for one season, sometimes for two seasons, if treated correctly with some fungicide. The best time to sow seeds is March. Sow in a medium made up of one part mountain gravel, one part compost/leaf mould, and one part red soil. Mix well until you have a very well-drained, loose mixture. No artificial fertilizers should be added. Part or parts refer to level wheelbarrows. Seed trays must have good drainage. Scatter the seeds lightly over the prepared, damp sowing mixture. Firm them down lightly. Dust the seed with fine ashes of wood (grey powder), before covering them to keep the insects away. Place the seed tray in a cool, shady, well-ventilated house. The sun should not shine on the seed tray in the germinating stage. Seed starts germinating from 4-6 weeks; some species can take longer. Germinated seeds should be watered daily, the seedlings damp off when over-watered. As they develop into the third to fourth leaf stage, do not remove the seedlings with a dibber but rather shake the soil out of the pot, wet it and loosen it, so that you do not damage the root system. The transplanting soil mixture is as follows: one part compost/ leaf mould, one part mountain gravel, three parts red soil. Add a handful of bone meal and 3:1:5 or 2:3:2 to transplanting soil mixture.